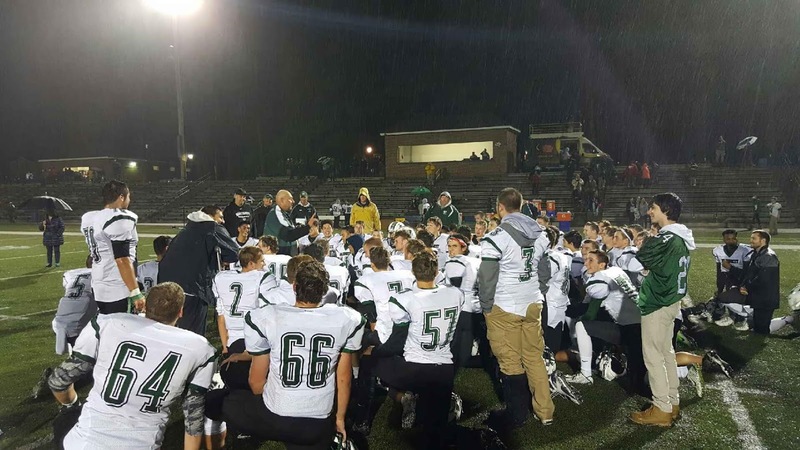 Wachusett coach Mike Dubzinski talks to his team after the Mountaineers' big win at Leominster. I'm no fan of pre-season rankings. They set up false narratives, raise/lower expectations almost arbitrarily and, let's be honest, they're almost always laughably wrong. At the high school level, where so much can change from year to year, pre-season rankings pretty much only serve to make guys like me look silly. Yet I was still suckered into doing pre-season Central Mass Power Rankings the last few years… But no more! Now, with the benefit of the first month of football already behind us, I present our first Central Mass Top 10 of 2016. Man it feels good to do rankings when I actually know something about what these teams are like on the field. Check out our CMass Top 10 below! The Pioneers topped powerful Nashoba Friday night, and still haven't loss to a Massachusetts team yet in 2016. Their lone loss to Connecticut power Xavier is forgivable, and their Week 1 win over Catholic Memorial may end up being one of the most impressive victories in the region. The Mountaineers are unknowns no more, as they spoiled opening night in Leominster by grinding the Blue Devils down. With one of the most loaded backfields, and stoutest defenses in the region, Wachusett is in the driver's seat of the Mid-Wach's largest division. The Indians have been nothing short of dominant, defeating their first four opponents by a combined score of 144-21. Syracuse commit Ifeatu Melifonwu has been unstoppable running and catching the ball, but don't sleep on this physical defense, which has been bullying people up front. This Auburn team looks like the Rockets of old, and coach Jeff Cormier may have the best all-around quarterback he's had in some time in senior Steve Saucier. After an opening-night scare against rival Leicester, the Rockets have won their last three games all by at least three touchdowns, and look like a team that can challenge Grafton at the top of their league. It's been a frustrating two weeks for the Blue Devil faithful, but losing to BC High and Wachusett, two of our Top 25 teams in the state, is nothing to be ashamed of. Still, Leominster hasn't had many positives to pull out of those two games, and will need to find a way to limit big plays on defense, as opponents are finding far too much room to run against a talented Blue Devil front-seven. The Tomahawks became fully-loaded Shepherd Hill's first victim, but let's judge Algonquin's first month as a whole: It was a total success. Sitting at 3-1 and in the thick of the playoff race, with a defense that's as physical as they come, T-Hawk fans have to feel good about the state of their team. This week's trip to Leominster will tell us a lot about the Tomahawks and the Blue Devils. Much like Leominster, it's hard to hold Nashoba's two losses against it. The Chieftains fell to Algonquin on opening night, and lost to St. John's last Friday. But, Nashoba has seemingly re-loaded well, after losing a ton of leadership from last season's state championship team. The Colonials gutted out a 21-20 over Marlboro, showing they can win both shootouts, and slugfests. Shrewsbury always seems to have a terrific offensive line, and solid quarterback play, but it's been the skill talent that has set this team apart. This week brings a trip to cross-town rival St. John's, and as we've seen over the years, in multiple sports, when those two teams get together, anything can happen. The Tigers are the story of the young season, defeating small-school juggernaut Littleton two weeks back, then blowing out a solid Clinton team Friday night. With a great defense, and balanced attack, Maynard doesn't need a huge roster to compete with some of the best programs in the region. The Bernardians lost a ton of skill talent from last year's state finalist squad, but bring back size and physicality in the trenches. It's been St. Bernard's physicality that has flustered opponents in the early going, and the Bernardians look like they have a chance to make another deep playoff run. SPM is on our radar after a convincing win over Worcester rival Doherty, and Shepherd Hill jumps back in after a win over previously unbeaten Algonquin. Quabbin can throw the ball on anybody, and Oakmont is a team that takes a backseat to no one in the hitting department. Doherty may have taken a body blow this week against the Guardians, but the Highlanders have too much pride, and talent, to stay on the mat for long. Littleton may have an early loss, but count the Tigers out at your peril, and Cole McCubrey makes West Boylston must-see every week. Max White-Cohen and Uxbridge are licking their wounds from their first loss, but don't count on that offense staying down, while a young Northbridge team is seemingly finding its groove. Marlboro seems like it is this close to breaking through, so keep an eye on the Panthers in the coming weeks. Shepard Hill, Webo, and Littleton all over stb. Would b a slaughter fest. With all of their stars back they return to their usual unmatched strength.